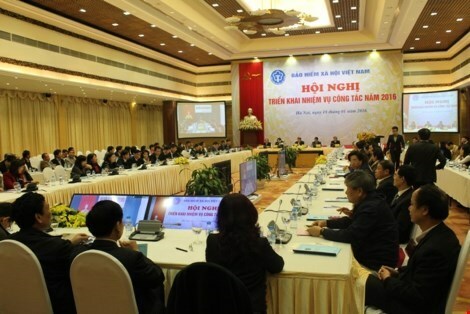 Hanoi (VNA) – Social and health insurance is expected to cover 72.4 million people in 2016, heard a conference of the Vietnam Social Insurance (VSI) in Hanoi on January 18, to put forth tasks for the sector this year. Over 12.4 million people are projected to join compulsory social insurance, 10.5 million to participate in unemployment insurance and 72 million to use health insurance, while the number of voluntary insurance participants will exceed 300,000. The VSI has also set the target of collecting 235 trillion VND (10.6 billion USD) from social, health and unemployment insurance, and to spend nearly 237 trillion VND (10.7 billion USD) on the work. According to VSI Deputy General Director Nguyen Minh Thao, 70.2 million people partook in social, health and unemployment insurance in 2015, a year-on-year increase of 8.3 percent. The number of health insurance users rose sharply last year, especially in localities which used to experience low coverage, he said, citing the national average at 77 percent, 1.6 percent higher than the rate set by the Prime Minister. Thao added that the sector collected more than 216 trillion VND (9.72 billion USD) from social, health and unemployment insurance in 2015, up 6.2 percent compared with the Prime Minister’s target and 9.5 percent against the previous year’s figure. The sector also paid attention to administrative reform, as well as the application of scientific and technological advances, the official said. Addressing the event, Deputy Prime Minister Vu Van Ninh praised achievements the sector recorded in 2015. The VSI has joined hands with ministries and agencies in issuing laws, including Social Insurance Law and Health Insurance Law, which have been amended to meet people’s legitimate requirements, he said. Alongside the reforms, the agency has also performed outstandingly in expanding and managing insurance participants, controlling collections and expenditures, and reducing debts, the official noted.